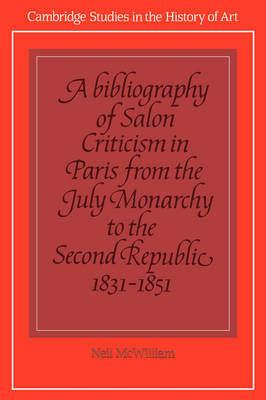 This bibliography provides a source for reviews of the state-sponsored Parisian exhibitions of painting and sculpture (Salons) held during the July Monarchy and Second Republic (1831-1851). It includes an extensive list of references, each presented in a standard format, with titles, dates and ordering codes based upon the holdings of the Bibliotheque nationale in Paris. It is indexed both by authors and by periodicals. The essays and articles that are catalogued are of fundamental importance in establishing a picture of contemporary reactions to art in mid-nineteenth-century France and yet the standard work by Maurice Tourneux, Salons et expositions d'art a Paris, 1801-1870, has been out of print for several decades. By incorporating and correcting the relevant material from Tourneux and adding new references gathered from unpublished nineteenth-century manuscript bibliographies and a broad sample of the periodical press, this work offers a substantial increase in the volume and range of criticism available for analysis by cultural and literary historians.